At the end of October, Porsche conducted a private test at the Monza circuit in Italy. This isn't exactly newsworthy in and of itself, as things are likely getting a bit cold in Germany this time of year, so they've moved testing southward closer to the Equator. Porsche took over the famed Italian circuit to put a few cars through their paces, and lucky for us Matt, from the YouTube channel MattyB727 - Car Videos, was there to capture one of them on video with excellent sound and vision. So, here's the million dollar question, just what the type of Porsche is it? As the video title suggests, perhaps this is some type of new Porsche racing car. A GT2 Cup to replace the current GT3 Cup? Maybe they're testing a turbocharged engine for next year's 911 RSR to run at Le Mans? We are a bit skeptical of that theory, given that Porsche in question seems to have functioning LED daytime running lights and turn signals. We've now watched this video a few dozen times to try to piece together what exactly we're looking at here. We can't smell it or touch it or taste it, so we'll have to use our two remaining senses to figure out this conundrum. This one is pretty straight forward. It clearly looks like a more aerodynamically aggressive version of Porsche's current 991 GT2 RS that launched not long ago. There is a GT3 Cup-style rear wing with taller uprights, a pair of cannards on either side of an otherwise very GT2 RS looking front bumper. That bumper looks to have a tow strap tucked into it, and some kind of sensor apparatus in the middle, but otherwise as normal. 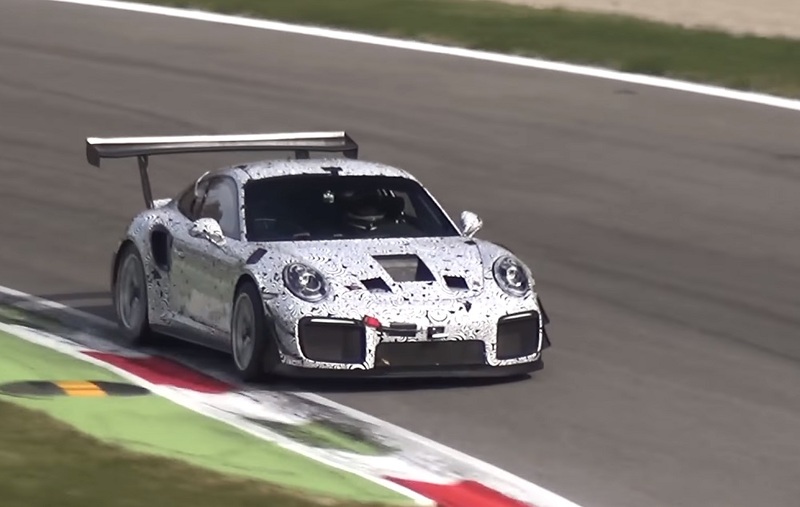 The rear bumper looks to be standard GT2 RS, though with the camouflage livery it's difficult to tell for sure. The front lid has what appear to be some interesting non-standard vents. These vents could simply be related to some testing procedures and ease of access or camouflage to make this kind of guessing game harder. However, we're inclined to believe they're used for serious cooling purposes. Could this car be some kind of track-day special model that Porsche is bringing out based on the GT2 RS? The aero, the integrated rear roll bar, smaller diameter wheels with taller sidewall racing slicks, and what appears to be a hookup for an air-jack on the passenger side rear quarter window would seem to point to such a thing. That said, street car manufacturers are getting crazier with what they'll allow to be sold in dealerships. Take for example, the Dodge Viper ACR with a splitter that was too large to be used on the road so it was delivered in the trunk, or their Challenger Demon that can be ordered with non-DOT drag slicks. Based on the way the driver is bossing this car into the kerbs as much as he can, occasionally getting a few wheels airborne, we're almost positive that Porsche is conducting suspension sturdiness tests, particularly on the front wheels. Is Porsche building the ultimate street-legal track-day car? If so, what are all of those cooling vents for in the front trunk? Let your ears tell you. First thing first, this Porsche sounds almost exactly like a stock GT2 RS exhaust note, and the gear changes certainly seem to indicate a standard PDK gearbox. There's something else there, though, something more than turbo sound. Some viewers have indicated that they hear a boost bleed off or the whine of a straight-cut gearbox, but our theory is that you're actually hearing the sound of a hybrid system's regenerative braking. You can hear a distinct whoosh/whistle sound as the Porsche comes down from speed at the 0:27, 0:58, 1:33, etc. If this was turbo spool or gear whine, it should change in pitch with each downshift, but it's a very linear noise that appears to be connected to wheel speed. At the 1:19 and 2:50 marks, you can hear another interesting sound. It is possible that this is the whistle of a spooling turbo, but it sounds to us like there might be some electric energy deployment happening there as well. Porsche has been working with power-adding hybrids for over a decade now, and it's about time they should be thinking about applying it to a 911-based street car. While some companies, like Toyota and Chevrolet for example, use batteries and electric motors to increase the efficiency of their final output, Porsche has a history of using those same methods to add lots of power. Would the 918 Spyder have been as fast at the Nurburgring, or as exciting, if it didn't have the instant-on torque delivery that electric motors provide? Is the Panamera Turbo S e-Hybrid a faster car than its non-hybrid brother? By putting their hybrids at the top of the performance ladder, Porsche has eased the mind of the Porsche Purist, convincing them that hybrids aren't such a bad thing. They've shied away from a hybrid 911 because people could be up in arms about their iconic sports car sharing technology with a Prius. That disgust might be assuaged if such a hybrid 911 were able to crack off a lap of the Nurburgring in under 6 minutes and 40 seconds, right? Obviously this is all speculation, but how awesome would it be? We know that the 991 is on its way out, and Porsche is known to end a model line with something wild and crazy. Wouldn't a 900-horsepower all-wheel-drive track-special hybrid mega-911 be just the kind of car to send off the 991 in style? We know that Porsche is preparing to show off something seriously awesome at the LA Auto Show at the end of the month, would it be too much of a stretch to hope it's this? Now, about that screaming naturally aspirated Cayman that shows up at 2:33. We've heard rumors of a new GT4 in the works with a 4-liter GT3-based engine. Could this be it? Could it also break cover at LAAS? Your guess is as good as ours. I’d like to see a Porsche 928 updated to be a plug-in hybrid with AWD. The engine would be in front behind the front wheels; the transmission would be in back in front of the rear wheels–this would give great balance. The batteries would be spread below the front and rear passenger compartments. Electric motors could be on both axles. How about it?? ?